Ohio, IL was recently awarded Runner-up Water Plant of the Year by the Illinois Rural Water Association. The Village of Ohio is a small rural community in northern Illinois with well water requiring arsenic removal, color removal, iron removal and manganese removal. 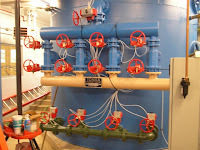 Tonka designed and manufactured a 275 gpm Dualator® packaged treatment system incorporating aeration, detention, and filtration in one unit to remove the arsenic, iron and manganese followed by an Ion Exchange vessel to remove the color. The system utilized arsenic co-precipitation with iron as the most cost effective arsenic removal solution to comply with EPA regulations and provide the community with safe drinking water. Congratulations to Ohio, IL and their operator, Jim Lamkin!